Halloween centerpieces add the finishing touch to each of your Halloween table settings, so select from our special spooky traditional Halloween look. Each of our centerpieces will coordinate with our Halloween table decorations for a complete enjoyment by your guests. TRICK-OR-TREAT! 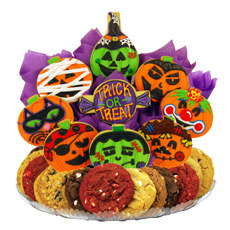 This bouquet puts a new spin on the traditional Jack-o-Lantern These pumpkins are dressed and ready in spooktastic costumes for your next Halloween bash!- This item is priced as a 9 cookie. 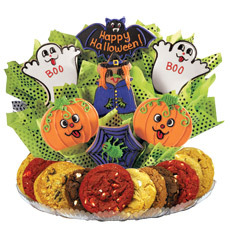 With all the traditional Halloween icons, you can't go wrong with this freshly baked cookie arrangement. The hardest decision is deciding "witch" cookie to eat first!- This item is priced as a 7 cookie. Our Spooky Scenes Centerpiece features a black tissue honeycomb base with a round card stock top. This centerpiece measures 11 inches x 10 inches. The Spooky Scenes Centerpiece will look great on your Halloween tables! Our Flaming Table Torch simulates artificial fire with moving orange and yellow fabric flames. Includes a 20-watt halogen bulb and UL-approved adapter. Each Flaming Table Torch is 1 foot high x 8 inches wide. Fill this Cauldron with candy or other favors and hand it out to your guests for a fun treat! this cauldron measures 6 inches x 8 inches and has a 7 inch diameter opening. Perfect for storing trick-or-treat candy in to hand to the little ghosts and goblins who come knocking on your door.